The Capitals restored a bit of order Monday night with a convincing 4-2 win over the high-flying Edmonton Oilers. After a sloppy outing against the Dallas Stars on Saturday, the Capitals cleaned-up a majority of the blunders and played a relatively sound game at both ends of the ice on Monday night. Pheonix Copley turned in an excellent game, stopping 31 of 33 shots. 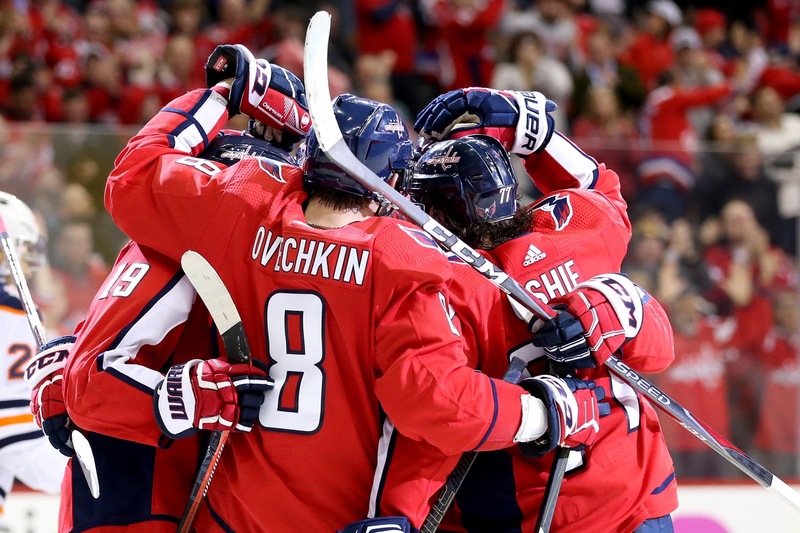 The Capitals return to action Wednesday night when the host the Pittsburgh Penguins at Capital One Arena. Puck drop is 7:30. Capitals’ bench boss Todd Reirden mixed up his lines again at morning skate on Monday, promoting Dmitrij Jaskin to the top line, and demoting Jakub Vrana to the 4th line. Brooks Orpik was out for a third straight game. Madison Bowey once again filled in, paired with Christian Djoos. The Capitals 4th line would make an immediate impact in this one. Jakub Vrana would score at 2:44, with Devante Smith-Pelly scoring three minutes later to take an early 2-0 lead. Connor Mc David would close the gap with a power play goal at 10:24 to make it 2-1 at first intermission. T.J. Oshie would make it 3-1 on the end of a beautiful pass from Nicklas Backstrom before Leon Draisaitl would pot the Oilers second goal of the game. Alex Ovechkin would add a power play goal to make it 4-2 at the second intermission. The third period would go scoreless. Our complete game recap can be found here. 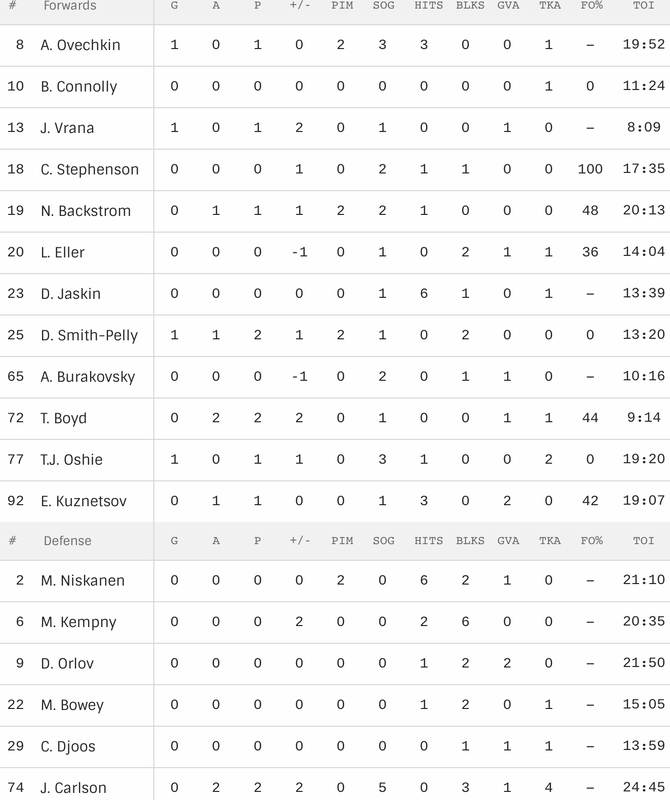 The NHL box score can be found here. Stats provided by Natural Stat Trick are here. The Capitals entered the contest 17th in the league in shots on goal per game with a 31.2 shots/game average. That’s a slight increase from last week. 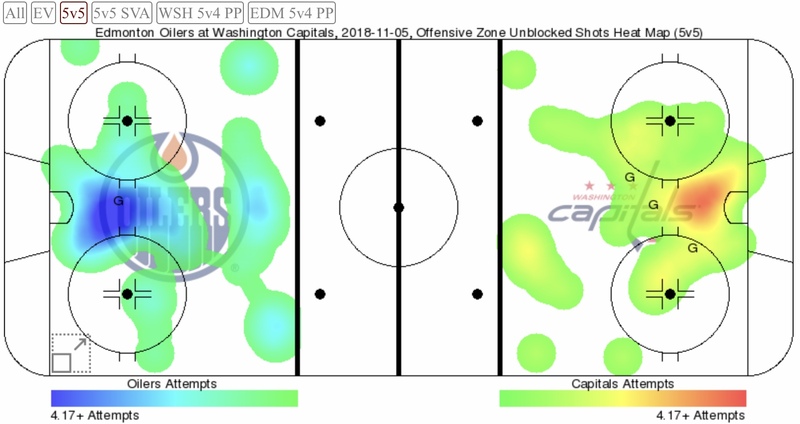 The Capitals would out-attempt the Oilers 17-1o for the first period, but the Oilers would respond in the middle frame, out-attempting the Caps 25-18. No surprise, trailing by two goals, the Oilers out-attempted the Caps by a wide margin in the third period, 24-7. The Oilers led in shots on goal 33-23 for the game. Pheonix Copley yielded a relatively soft goal for the Oilers first tally, but settled down as the game proceeded. Copley stopped 31 of 33 shots for a .939 save percentage. This was Copley’s second straight win. Cam Talbot stopped 19 of 23 shots faced for a save percentage of .826. The Capitals were 1 for 2 and the Oilers 1 for 4 on the power play. The Captains, Alex Ovechkin and Connor McDavid would notch the power play tallies. The Oilers won the battle at the dot, 58-42%. Brett Connolly was 0 for 2, Chandler Stephenson was 2 for 2, Nicklas Backstrom was 11 for 23 (48%), Lars Eller was 4 for 11 (36%), Devante Smith-Pelly was 0 for 1, Travis Boyd was 4 for 9 (44%), T.J. Oshie was 0 for 2 and Evgeny Kuznetsov was 4 for 9 (42%). Jakub Vrana getting only eight minutes of ice time must be punishment. You can’t have a player that talented practically watching for the bench. Even so, Vrana was able to score the teams first goal, despite the reduced playing time. Madison Bowey was up to 15 minutes of ice time, as Reirden continues to build trust in him. This entry was posted in News and tagged Alex Ovechkin, Devante Smith-Pelly, Edmonton Oilers, Jakub Vrana, Jon Sorensen, T.J. Oshie, Washington Capitals. Bookmark the permalink.